Hallie D. McCutchan, age 84, of Harrison, AR, passed away Wednesday, March 13, 2013, at Washington Regional Medical Center in Fayetteville, Arkansas. He was born December 25, 1928, near Grand River, Iowa, the son of Dalton and Leona (McIntosh) McCutchan. Along with his parents, Hallie was preceded in death by his brother, Marcus McCutchan. Hallie was a member of the First United Methodist Church. He was previously of Phoenix, Arizona. He married Mildred Crawford December 25, 1953. He was a cattle farmer and owned McCutchan Plumbing and Electric for 35 years. Hallie’s many associations include the Arkansas Cattleman’s Association, in which he was former Area 1 vice president; an executive board member; was a state delegate to the Republican Party and president from 1983 to 1985. 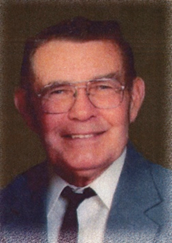 He was a current member of the Boone County Farm Bureau and Boone County Cattleman’s Association and on the ABC Board. Hallie was also Senior Farmer of the Year 2010 and together the Boone County Farm Family of the year 1975. Hallie is survived by his loving wife, Mildred McCutchan; his daughter and son-in-law, Carman and Louie Williams; his grandson, Tyler Williams; his brother, Kermit McCutchan; his sister-in-law, Aleene; a host of other family; and many dear friends. Memorial service was held at the Roller-Christeson Funeral Home, with Bro. John Darnall officiating. Hallie was a descendant of John McCutcheon, pioneer settler of Augusta Co., VA through son, Samuel, who married Elizabeth Fulton.